Neocolonialism is the growing middle class movement that is spreading across the world. It self-identifies wherever it is as a grassroots activist movement yet it is dominated by individuals who are not grassroot activists. The black grassroots activism in the US is experiencing what is currently overtaking indigenous grassroots activism here – both ‘movements’ propagate the idea that the crisis can be ‘fixed’ within the current system and social order. As a result, both maintain the status quo and the current class system. If nothing else, common sense should tell us that using the same constructs of the current system to address the crisis before us will ensure that the names and faces of those in ‘power’ will change – not the system itself. Using the same thinking that got us into this mess to get us out is a sure recipe for failure. We need a revolution that forces a system change. A shift that completely turns upside down the current system’s model of governance and directly empowers the most oppressed, the poorest, the most voiceless. It must redefine human relationships, community as family, localization as opposed to globalization, and it must be driven by a spiritual awakening that shifts the internal universe of those who are champions within it to model selfessness – not ego. Not the witigo syndrome that has overtaken all humans on Turtle Island since contact. As climate change further destroys our world, the world we all live in will become increasingly harsher – selfish individuals will soon become those who place at risk the security of those around them. Communities that foster processes that build community interdependence will fair much better than those who perpetuate individualism. Time unfortunately will prove me correct in this. The four ‘official’ founders of Idle No More. INM is top down. It is incorporated and by definition uses corporate governance to carry-out its activities. Corporate governance is the point at the top of the triangle – the highest level of authority and power under that model of governance… this is corporate governance and this model of governance is colonial. INM attracts very ego-centric individuals to it. I have personally witnessed this tendency from the beginning. An ego-driven ‘movement’ is destined to fail. And from what I am witnessing the smoke-and-mirrors of the last eight months is beginning to reveal the shaky foundation upon which INM was built. It has not been an authentic response from the beginning. From its inception, INM has perpetuated the lie of the current system by fighting for change / reform of it. Will reforming the Canadian government policy agenda really affect lasting meaningful change that results social justice for all? For climate justice? No. It will not. Why? Because the entire global system must be changed. Only an authentic grassroots movement that awakens and empowers the most oppressed – those at the very bottom of the current social order – can achieve this. INM has not been effective in doing this and will never be. Why? It is top down. INM took off because of social media. It did so not because the ‘founders’ had any strategy or real sense of work that needs to occur to address the global crisis. It became a phenomena not because any one of the founders had any deep understanding of any of the global issues. INM piggy-backed on the work of countless activists who had been the ones turning the soil and planting the seeds. Yet, the founders claimed the harvest as their own and from the beginning have refused to work alongside of any of those who had actually laid the groundwork for the awakening that occurred. And in doing so, in my opinion have and continue to effectively misguide 1000?s towards a vision of a ‘new Canada’ not a new system. As a witness to these events, I am quite confident in the accuracy of my assessment and I am equally confident that as a ‘movement’ it will not last. There is nothing to it. And no, I bear no dark hatred or burning jealousy toward any of the founders. In fact, the less any of us focus on INM and the more we focus on building a real movement of THE PEOPLE the better. I found your summary Interesting. I have to say, it is misguiding. Humans are made of ego within a community. INM acknowledge this and try to create a strong community. 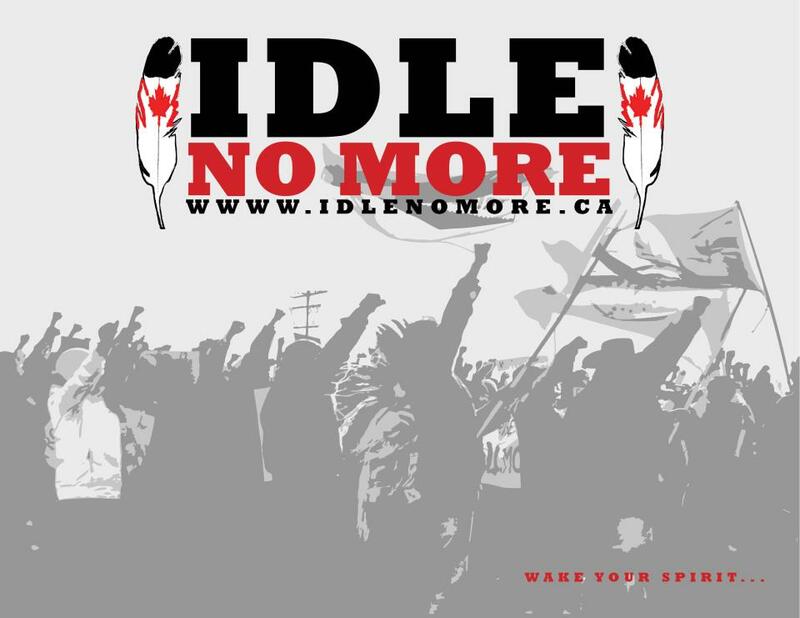 This is why these 3 words are powerful, Idle No More. Once we choose to be INM, we do everything possible to make this global change happen. It takes a lot of energy, but it is very empowering. INM is a grassroots movement, where everyone’s voice is welcome. And if you believe what you are writing, how can you claim to be for a global change when you bash the people who are trying to make it happen…. A grassroots activist INM follower.